While almost every visitor to Paris comes to the Île de la Cité—the island home to some of the most famous sites in Paris—most visitors miss the Deportation Memorial or the Mémorial des Martyrs de la Déportation. 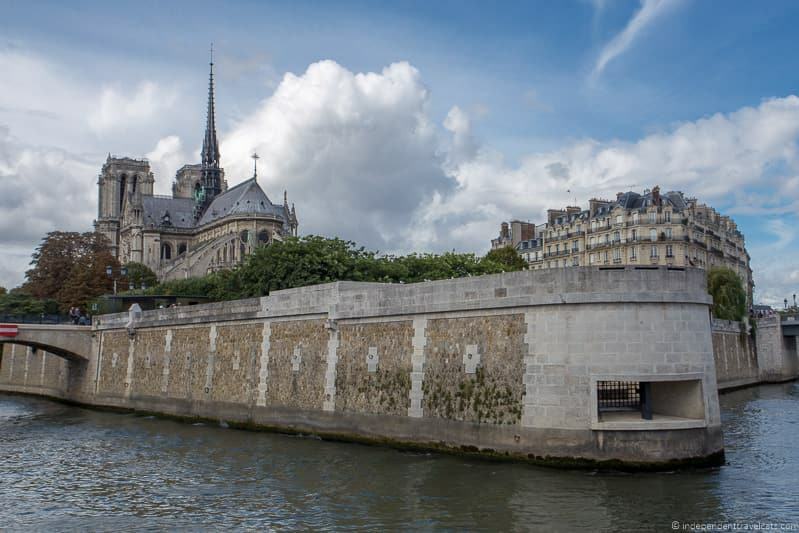 It can be easy to overlook the Deportation Memorial on the Île de la Cité given all the blockbuster historical sites—Notre Dame, Sainte-Chapelle, the Conciergerie—as well as the flower market and loads of souvenir shops that fill up the island. But if you are looking for a more serious, quiet place of reflection, I would recommend a quick visit to the Deportation Memorial, which is a memorial to the 200,000 French citizens who died in Nazi concentration camps. 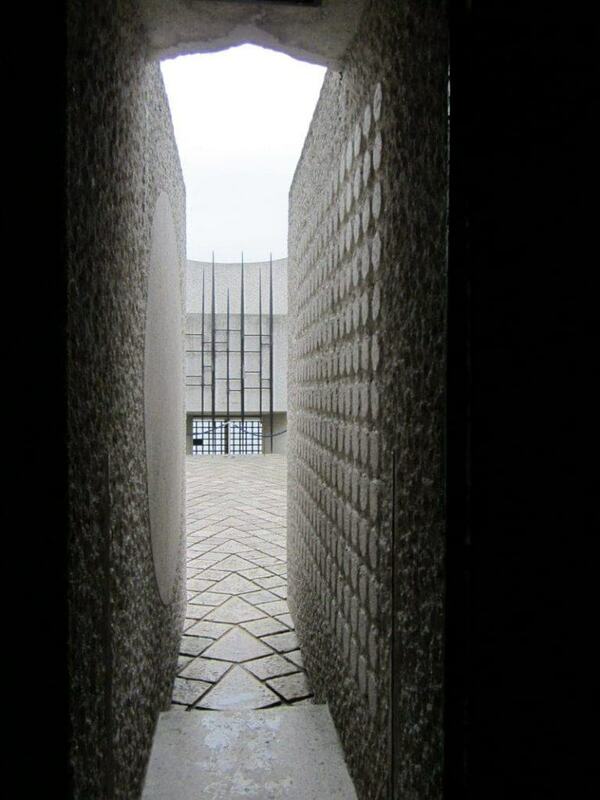 We’ll share everything you need to know to visit the memorial and tell you about our own experience visiting the Deportation Memorial in Paris. 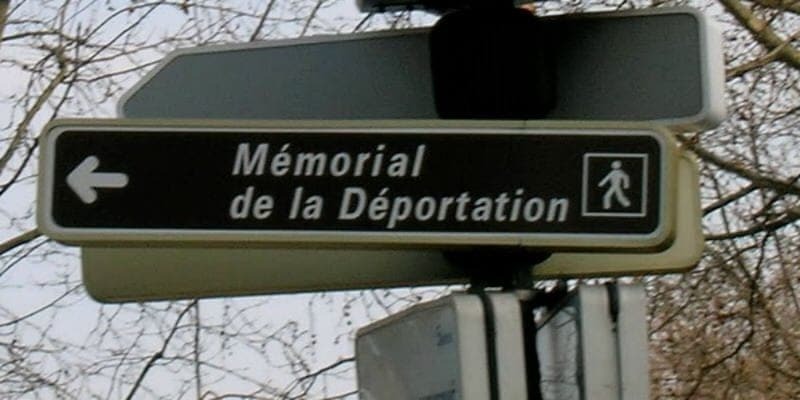 The Deportation Memorial is located at the eastern tip of the Île de la Cité (tip of the island near Île St. Louis) behind the Notre Dame cathedral. There are a number of ways to get to the Île de la Cité by public transportation, but the closet metro stop is Cité. Other close stops are the RER B stop St. Michel Notre Dame and Metro stops Maubert-Mutualité and Pont Marie. Once you are on the island, you should see brown signs directing you to the Memorial de la Déportation. It is free to visit the memorial. The Deportation Memorial is open year round Tuesday through Sunday, but closed on Mondays. Hours are typically 10:00am-7:00pm (10:00-19:00) April to September and 10:00am-5:00pm (10:00-17:00) October to March. 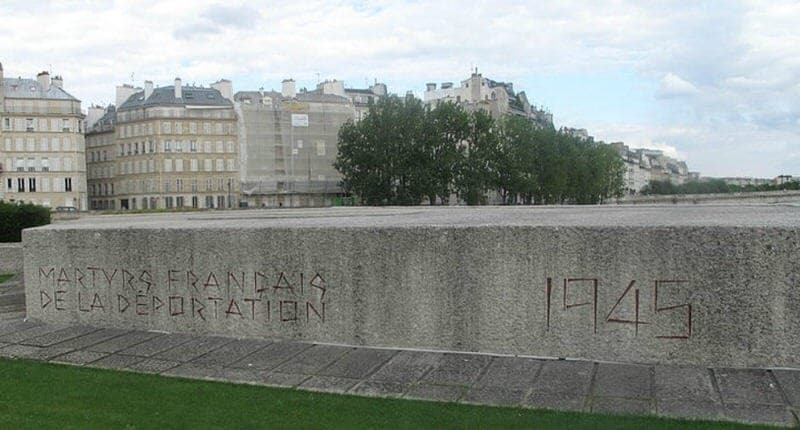 The official website provides good basic information about the memorial as well as links to more information about the history and memory of the French who were deported and killed during the Nazi occupation of France. We had been meaning to visit this memorial for two years. We typically stay in an apartment located less than a 10 minute walk from this site, but it seemed like we always were walking by before it opened and returning home after it closed. But this Spring we finally made it to the Deportation Memorial. At the entrance, we were greeted by a woman with a clipboard. She asked us to be quiet and respectful while inside and that although you can take photos, photos of the interior rooms are meant only for personal use and not for public posting. So I will respect that and only post a few exterior photos of the monument. Given the small size of the interior space, they limit the number of visitors who are allowed inside so you may have to wait in a short line as we did. Before visiting, it is good to read up a bit on the history of the German occupation of France and the experience of those deported to Nazi concentration camps to better appreciate the symbolism found in the memorial. The Deportation Memorial website is a good place to start and this article on the Holocaust in France should give you some basic information. There were a couple of information placards outside that provided some good basic information in English, but all the quotes and informational panels inside the memorial is in French. 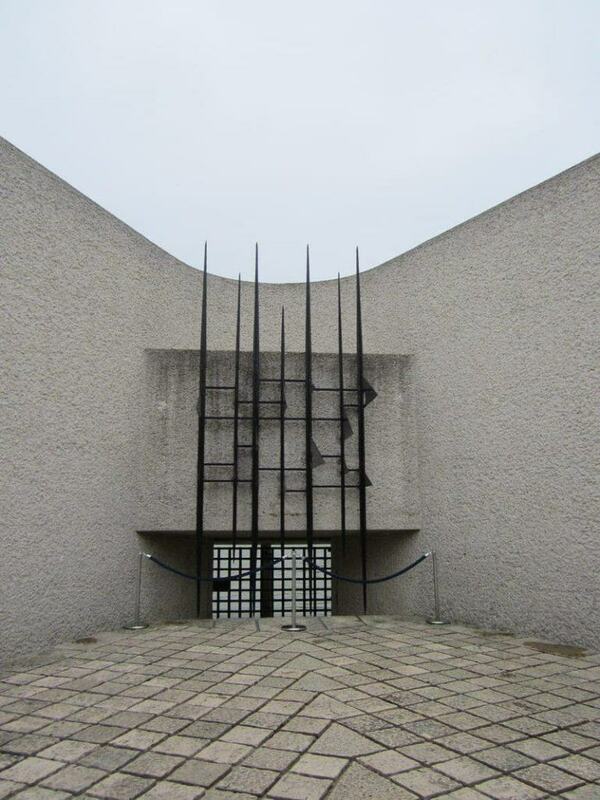 The Mémorial des Martyrs de la Déportation was inaugurated in April 1962 by President de Gaulle and is a memorial to the approximately 200,000 people deported from Vichy France. The exact numbers of those who were arrested, interned, and/or died during the German occupation of France are unknown, but it is estimated according to the research indicated on the panel below that 160,000 people were arrested in France and deported. Not all were French citizens, as many were Jewish immigrants who had fled from nearby European countries. About 85,000 of those arrested and deported were members of the French Resistance or political opponents (over half would die) and 75,000 were Jewish (approximately 97% would die, primarily in concentration camps). There was estimated to be about 340,000 Jews living in France in 1940 and about 75% are believed to have survived to the end of WW2. While political opponents and Jews were the main people arrested and deported in France, other groups (e.g., homosexuals, Roma, Jehovah’s Witnesses, Slavs, the handicapped) were also persecuted by the Nazi regime as well. First, we walked down a set of steps and were immediately surrounded by gray stone walls. In front of us was a stark but frightening iron gate. We stopped and tried to imagine what it might feel like to be able to see the sky above you and even the Seine river below you, but not be able to escape because of the high walls and bars. Next, we silently entered the interior of the memorial single file down a narrow hallway. The chamber is meant to feel dark and claustrophobic to give you a small taste of what it might feel like to be imprisoned. The site of the underground memorial was chosen because it used to serve as a morgue. The hallway is dimly lit but lined with 200,000 illuminated crystals, each light symbolizing a deportee who died in the concentration camps. At the end of the tunnel is one bright light representing the eternal flame of hope. A circular plaque on the floor translates into English as: “They descended into the mouth of the earth and they did not return.” In the chamber and side rooms, you’ll see quotes along the walls from a number of writers and poets, including Louis Aragon, Jean-Paul Sartre and Antoine de Saint-Exupéry, as well as the names of concentration camps where French citizens perished. We also saw plaques, triangular urns (the shape of the identification badges prisoners were forced to wear) filled with ashes and dirt from the concentration camps, and a tomb of an unknown deportee. As you exit, you see a message above you that translates to: “Forgive, but never forget”. Familiar words if you’ve visited other Holocaust memorials. We spent only 30 minutes at the Deportation Memorial site, but we found it to be a very thought-provoking experience. While we are no strangers to Holocaust films and had only recently visited the Nazi Documentation Center, Dachau Concentration Camp memorial, and some other memorial sites, there is something powerful about the stark simplicity of this relatively small memorial site. At other sites, we’d sometimes felt overloaded with information or beat over the head with the horrors of the concentration camps, but here you are left more to just think and experience as you walk slowly and silently through this memorial. While we certainly learned more about the Holocaust at many of the other museums and memorials, there is something very powerful that we took away from this visit. It is also a great place to stop and honor the memory of all those lost in World War II. As we left the memorial and rejoined the hordes of people on Île de la Cité, we were both struck by the stark contrast between the “quiet prison” and the hustle and bustle of busy Paris tourist sites like Notre Dame. 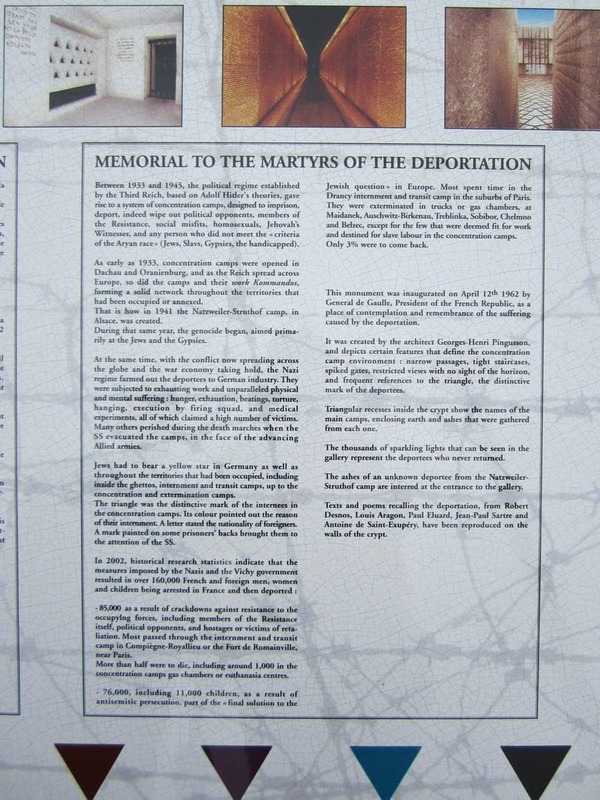 Have questions about visiting the Deportation Memorial in Paris? Have you visited the memorial? We’d love to hear from you. My sister and I visited in the 1980’s after a visit to Notre Dame. We discovered the memorial by accident. Both the Cathedral and the Memorial were important milestones in the re-connection of our relationship in our post-teenage years. We realized that our values were more aligned than we had thought and our response to both Notre Dame and the Memorial were identical and profound. The contrast between the grandeur and the simplicity of the two sites simply underlined the different ways in which faith can be expressed. We were never in any doubt that the Memorial reflected the dreadful loss of Jewish lives in the Holocaust, but we also appreciated that it reflected the loss of many diverse groups in occupied France. I sincerely hope that today’s fire at Notre Dame preserves the spirit of the cathedral and the spirit of the Memorial. Thanks for taking the time to comment and share you memories of visiting the Deportation Memorial and Notre Dame with your sister. Yes, I think that most people know of the Jewish suffering and deaths in the Holocaust, but of course millions of non-Jewish people also were sent to concentration camps (or put in front of firing squads) and died. Many people are not really aware of the extent of the non-Jewish deaths and it is great that they are remembered here. In fact it is estimated by the United States Holocaust Memorial Museum that 6 million Jewish people as well as 11 million others died as a result of the Holocaust. I was just watching something last night about the people who were mentally ill/handicapped being put to death, including one of Hitler’s own relatives in Austria named Aloisia. The extent of the genocide is staggering. The sites on the Île de la Cité have definitely been on my mind today as well with the fire at Notre-Dame. I hope that the main part of the cathedral can be saved and will some day be restored. It is one of my favorite landmarks in Paris, and it is the reason so many people like yourselves stumble upon the simple but meaningful Mémorial des Martyrs de la Déportation. I can’t imagine Paris without it. My great uncle designed it. There are also some parts of the memorial that are not always open to the public. Just stop a few minutes and think. This is a memorial for ALL the deported whatever their origins or beliefs !!! I must agree with the writer of the blog. This memorial is truly one of the most moving I have ever seen all over the world.. Sadly, we stumbled on it by accident, Something must be done to create some larger signage and perhaps an explanation as to what we are seeing and it’s significance. Architecturally, it is brilliant. I think a brochure with the significance of what are not aesthetics but are blatant iconic statements of the suffering of my people should be placed somewhere so visitors can get the full impact of what they are seeing. This is a memorial that everyone should see and everyone should spend some time thinking of what the memorial is saying–in stone and steel. And of course the contrast between Notre Dame and this simple memorial are near side by side examples of the greatness of man and his savagery. my heart leaping about with no place to go. This is very holy place–sitting writing this a chill comes over me and I shiver. I am 78 and have read extensively over my long life. Spent three months inside Kruk”s “The Jerusalem of Lithuania”. But this experience is essential–your heart, your breath, your fingertips. Truly sacred. In your description you didn’t mention that the majority of those deported were French Jews, and were included only because these were Jewish. Please don’t contribute to allowing anyone to forget that the Nazi final solution was primarily geared toward ridding Europe of Jews. Thank you. When I went to this memorial I was at first very saddened. The more time I spent there and the more I discovered what had happened here the more angry I became.. To be honest, being of French heritage I am also just a little ashamed of what happened in France from Vichy to Petain to Pierre Laval.. I am glad to hear that you found this memorial as it is not a popular destination, but this little memorial can really have a powerful effect on visitors as it sounds like it did for you. I don’t think many people are that aware of (or like to talk about) some of the not so great things that happened in France under the Vichy government. As you say ethnic and racial prejudices are still alive in France (as in most places in the world), but I do hope all of us have learned something from the tragedies of the WWII era. I got the official word from the contact you so kindly provided – there is no handicapped access to the memorial, but “it will be addressed soon”. Of course the memorial opened 52 years ago, so this is obviously not a priority. That said, a visit here is a truly moving experience, so if you are able to manage the steep stairs, don’t miss it! That’s really too bad. I hope they do add handicap access soon. Thanks for letting us know! Is there handicapped access to the memorial? I travel with a friend with severe arthritis and she couldn’t make it down (much less up!) those stairs. With the remaining survivors of the camps being quite old, I would think there must be a way for them to see this moving memorial. Hi Sue, thanks for stopping by our travel blog! Yes, the steps we took were not handicap accessible, but we did notice there appeared to be another possible entrance. I just e-mailed you at the provided e-mail address with some contact information on those who should be able to answer that question. Would love to have you report back on what you find out for future readers! I hope you and your friend are able to visit this memorial together. Thank you so much for posting this. I’ll make sure we will visit this museum in our upcoming trip to Paris. It is a great place for a quick reflective visit! Quite hidden for being in such a crowded spot of Paris. Hi, really enjoying your blog! I enjoyed this article, this is such an often-overlooked site even for Parisians. I also really liked the breakdown you did of your afternoon tea at Mariage Frères, one of my all-time favorite spots in Paris! I’m Chief Editor and principle tour guide for Localers, a boutique-sized company specializing in walking tours of Paris that are led by passionate local residents. Next time the two of you are in Paris please drop me a line, I’d love to personally take you on a tour of the city and show your our concept. Take care and safe travels! Yes, the Deportation Memorial doesn’t seem to be well-visited by people we talk to who have been to Paris. I am such a tea lover and hope to visit some more Paris tea stops on our next visit. We would absolutely love to take a walking tour with you on our next trip, thanks for the offer! That looks like a really interesting memorial, I never knew about it before but will keep it in mind if I ever find myself in Paris again 🙂 thanks for sharing this! Yes, I know you were disappointed with some of the commercialization at Notre Dame, but this little memorial located only a minute or two walk from there is a nice place for a bit of serious reflection. I stumbled upon the Deportation Memorial when I was exploring Paris but it was closed at the time. I didn’t know it had a name until just now! I’ll have to go back sometime so that I can go inside. Thanks for the information! Yes, you should definitely check it out the next time you are in Paris if you have time. It is worth a 20-30 minute stop.